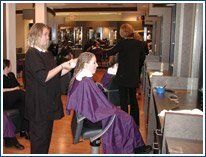 Cosmetology students develop their skills in cutting, styling, permanent waving and coloring hair and are expected to become fully licensed by the Ohio Board of Cosmetology upon graduation of this two-year program. Graduates will then be able to work in salons as licensed cosmetologists. Students are trained on Pivot Point International and learn the latest techniques from industry experts. Students will take the Ohio State Board Exam for Cosmetologists and will be fully licensed upon successful completion of the high school program and passage of that state exam. For those wishing to go into management and ownership, it is recommended that they study Advanced Cosmetology in the WCCC Adult Cosmetology program, or business at a two-year or four-year college. Seniors will be placed in area salons as soon as the instructor deems them able. They will still report to the Career Center for academic instruction, but will then go to their job sites instead of the lab for the second half of the school day for a nine-week period. Cosmetology students participate in SkillsUSA, a partnership of students, teachers and industry, working together to ensure America has a skilled workforce. All students also have the opportunity to participate in the Tech Prep Showcase through the Miami Valley Tech Prep Consortium. For more information, contact instructor Levetra Staten at 513-932-5677 ext. 5268, or levetra.staten@mywccc.org. The WCCC Cosmetology Salon is open for services to the public by appointment. Call the following number for information about services, prices and to schedule an appointment: 513.933.3947. See flyer below in Downloads.